Hey guys, this is my fourth post on this blog and getting good response from your side. So, it’s my duty and will post something new and unique which can be helpful for you. Today, I will discuss about an important time saver app. No no, its not a time management app but, you can definitely save your time using it. Let see two scenarios here. Let me discuss the first scenario. You feel hungry and wish to eat your favourite dish or snacks. Then what will you do? You will search nearest food truck, run (in hurry) to the food truck, and stand in queue (which is very boring and time taking) and just wait (waste time) for your turn to come. After a long wait you are at the order window and you order your favourite dish and again you wait (again waste time) for the order completion. So, after so much hustling and wasting time you finally receive your order. But, I am sure after so much effort and wasting time you can not enjoy food and just eat in a hurry. My friend, after this hustle bustle scenario now read the second one. You feel hungry and wish to eat your favousite dish. You just pick your tablet open Food Truck App and search (easy and calm) the nearest food trucks from your location or registered food trucks. Select your favourite one and check menu with price list, choose an item and order it (your job completed for now). You just pay hasslefree with Paypal. Food truck owner confirms your order and you get a notification for your order delivery time. You just go to the food truck location and receive your order (in an easy and simple way). So, folks, which scenario do you like most? The first one or second one? I am sure almost all of you like the second one that is very simple and easy as well as time saving. I know one question must be bothering you that how can I implement the second way to order food. So, the answer is with the help of Food Truck App. 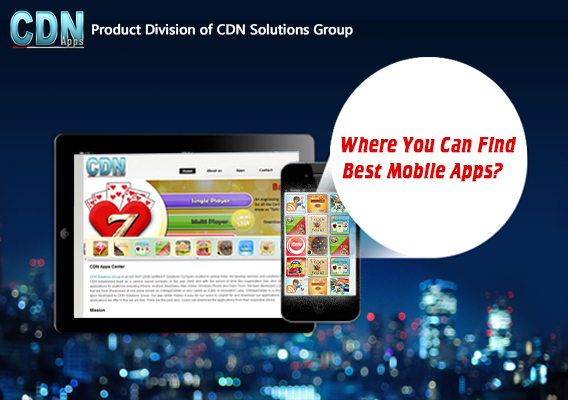 CDN App Center, the product division of CDN Software Solutions Pvt. Ltd. is developing a Food Truck App, on demand of the food truck owners and app users. Soon it will be launched and you can get all the related information at CDN App Center itself. There are two divisions of this food truck app one is for food truck owners and another will be for users. The food truck owner app will be available for Android and iOS (only for tablets) and user app will be available for both iOS and Android mobiles. I think it’s sufficient for this post. I will post more regarding the food truck app in coming write ups. You can also be updated about food truck app by like official Facebook page of Food Truck App. So, get ready to cut off the complications and make your life easy and simple with food truck app. I am sure your answer will be by checking Facebook or Twitter or other social media site. Right? No need to wonder that how do I know because Cisco Connected World Technology Report says that almost 90% smart phone users check their phones before brushing their teeth or before having a cup of coffee. Even I do the same…!! 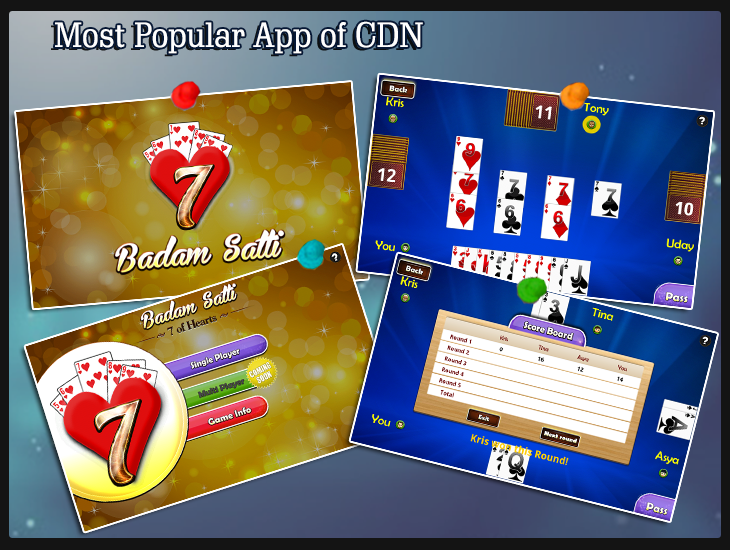 I downloaded an android app named, Badam Satti from CDN App Center. It is a card game app and I found that in this app Facebook and Twitter, both are integrated. Both are the strong social media platform. You can share your score with friends through Facebook. The point is that the strong social media platforms are also integrated in the normal apps. It shows that how much social media platforms are popular and demanding. If we check most visited site then, Facebook has overcome the world famous search engine Google. Apart from Facebook; Twitter, You Tube and Daily Motion are also very popular and most visiting social media sites. Although social media sites are in vogue from starting. But, smart phone revolution has boost up the popularity of social media sites and in present every single person in the world is using at least one social media platform whether it is a website or an app. Now the situation is people don’t visit sites because they have its alternate i.e. social media app. Almost all smart phone users use social media mobile apps in their phone. Social media apps have boosted the use of social networking sites. 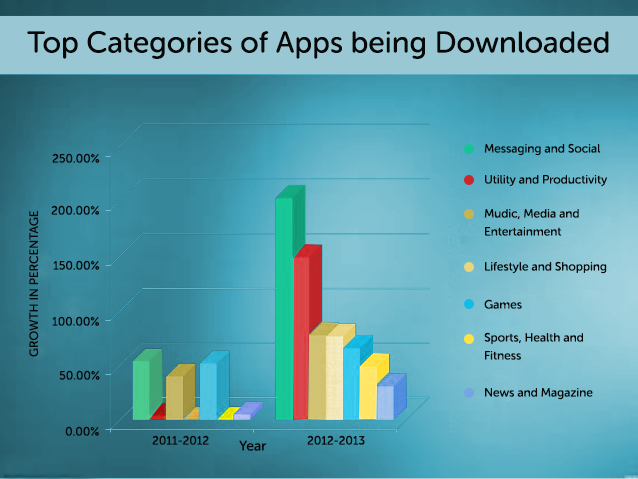 Have a look the statistics of most downloaded app categories; then it shows that in 2011-2012, 60% social media and messaging apps were downloaded. On the other hand, the figure is changed drastically in 2012-2013. In 2012-13, 201% social media and messaging apps are downloaded. Hence, it is clear that social media apps are on the top from starting of app revolution. In terms of business social media apps is the best medium to engage the people and to grow the business, whether it is Facebook App or Twitter app or You Tube app . While, in general, it is easy to connect to other people through social media apps. It is clear that social media apps’ future is bright and social media will generate the revenue day by day.